Synopsis: Former folk singer Helen Sear was a feminist wild child who proudly disdained monogamy, raising three daughters—each by a different father—largely on her own. Now in her sixties, Helen has fallen in love with a traditional man who desperately wants to marry her. And while she fears losing him, she’s equally afraid of abandoning everything she’s ever stood for if she goes through with it. My take: For various reasons Helen took the nontraditional path in life re relationships and motherhood. She tried to show her three daughters (from three different fathers) how to live a full life outside the constraints of marriage. Each daughter will accept or reject her example with varying results. As you would expect the three daughters are not cut from the same cloth. One strives for perfection, another is an artist, and the third is a procrastinator who has put off finishing her PhD until the last possible moment. As the four deal with changing life situations their attitudes will be challenged and they’ll find themselves possibly thinking differently going forward. What stood out to me was how the children (Helen’s grandchildren) were affected by their mothers’ actions – just as their mothers were affected by Helen’s choices. 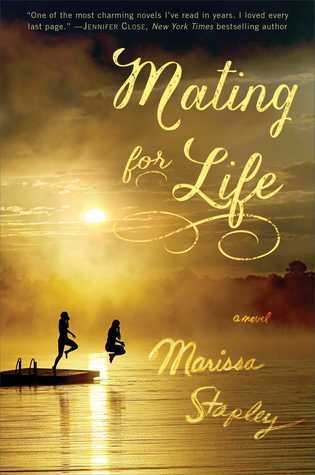 Book groups would have several topics to discuss with Mating for Life. Setting up each chapter is a description of the mating habits of various wildlife. They mirrored the characters in each chapter. I enjoyed that. I liked this thought-provoking novel and look forward to reading more from Marissa Stapley.